As we travel across Aotearoa New Zealand delivering our talks, we are taking time to suss out the local area, asking ourselves the question “if we were to live here, how would we make our zero waste lifestyle work?” By answering this question (through research, community connections, and persistent shop-hopping), we can then provide local tips and tricks at each of our talks. Given that this approach has led us to gather quite a bit of local knowledge, we thought that rather than leaving it all in our own heads, we should compile regional shopping guides for locals to refer back to (and also, to add to – if you let us know things we’ve missed, we can add them in!) 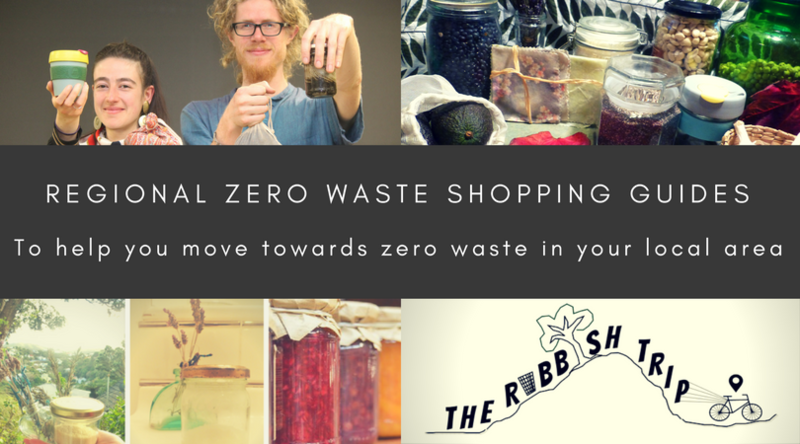 And so was born the idea of the regional zero waste shopping guides that you find here! We decided to do regional, rather than city or town, guides because we recognise that in some parts of the country, people leave their immediate area to get supplies further afield. In certain parts of New Zealand (particularly outside urban centres), it’s not always easy to get everything you need for a zero waste lifestyle on your doorstep, so a regional perspective is more useful. Having said that, we emphasise that we don’t necessarily condone burning lots of fossil fuels to drive across town, or through a region, to get an item packaging free when you could have gotten it in a packet a five minute walk from your house. However, we don’t necessarily recommend settling for the packaged item either. What we do recommend, is strategic shopping. So, if you know that you are going to a nearby town one day (say, for a doctor’s appointment, a bigger shop, a visit, or some other reason), and you can see you could do with a top up of some items that you can’t get locally packaging-free, then take the opportunity to get that item when you are already going out of town. Being organised enough to combine trips and do multiple things in one go, rather than driving back and forth for different purposes, is an important part of the habit changes that are part of the zero waste lifestyle. Remember too that you don’t necessarily have to rely on shops alone to get items in smaller centres. Starting (or joining) a co-op that buys items in bulk to share amongst a group of people is another really great idea. Where we know about co-ops, we try to add these into our guides. Taking advantage of other community initiatives, like community gardens and crop swaps, are another thing we try and link people up with through these guides. If we’ve missed some good ones, then do let us know (the key thing is that the kaupapa in some way supports people to produce less waste). Well done. Learnt much through your demo-thanks all the best for the rest of your travel. Tēnā koe Monty! Pai ana te tutaki i a koe 🙂 Mauri ora! Hi guys I know you are heading to Picton for Thursday night, see you there! Would love you to check us out we are a new little and local organic wholefood fruit and vegetable, eco living store just reopening at our home of 58 Hampden Street Picton. Check out our Facebook page Sustainance Picton. Can’t wait to hear what you have to say at our environment hub. We would like to sincerely thank all our loyal customers that have supported us during this time and we are going to miss catching up with you on your visits.